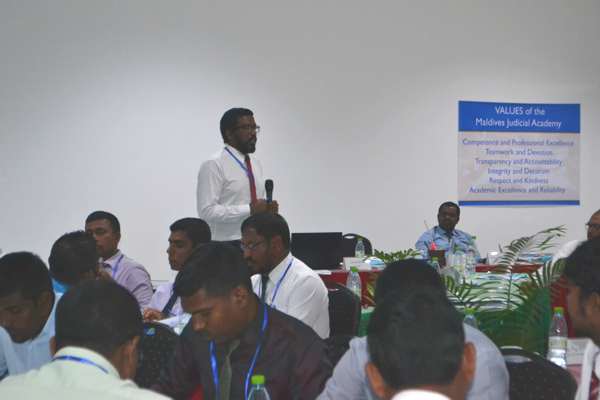 Maldives Judicial Academy is conducting Training Programs on the Criminal Procedure Code. The first program is a Training of Trainers Program for the Justices, Judges and Magistrates from the High Court of the Maldives, Superior Courts of Male’ and the Magistrate courts from the Islands. The purpose of the Seminar is to create a platform for an academic and skill-based discussion on the Criminal Procedure Code and to train trainers to conduct further trainings on the Code. The second program is a Seminar to create awareness on the Criminal Procedure Code for the legal staff of the courts of the Maldives. This program is conducted from the 21st to 25th November with the financial-aid by the UNDP Maldives. Sessions on both the program would be conducted at the Training Room of the Main Office of Stelco. International expert Mr. Malcolm Howard Simmons, will work as the trainer for the Seminar. Mr. Simmons is currently working with the Kosovo Judicial Institute as a Trainer, and is also presiding the EULEX (European Union External Action Program) Judges Panel in Kosovo. The Maldives Judicial Academy opens Enrollment opportunity for the Seminar on Criminal Procedure Code for Lawyers. 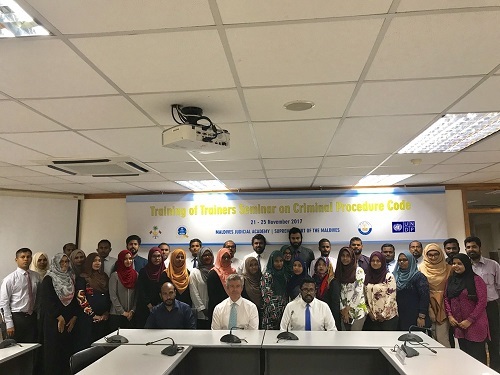 The Maldives Judicial Academy, with the services of international expert Mr. Malcolm Howard Simmons in collaboration with UNDP Maldives is conducting a Seminar on Criminal Procedure Code. Mr. Simmons is currently working with the Kosovo Judicial Institute as a Trainer, and has worked as an international criminal judge assigned by the European Union to work in Kosovo, and is also presiding the EULEX (European Union External Action Program) Judges Panel in Kosovo. The Seminar would be held from 24th to 25th November 2017 in Male’. The Maldives Judicial Academy opens enrollment opportunity for lawyers. Follow the link below for more information. 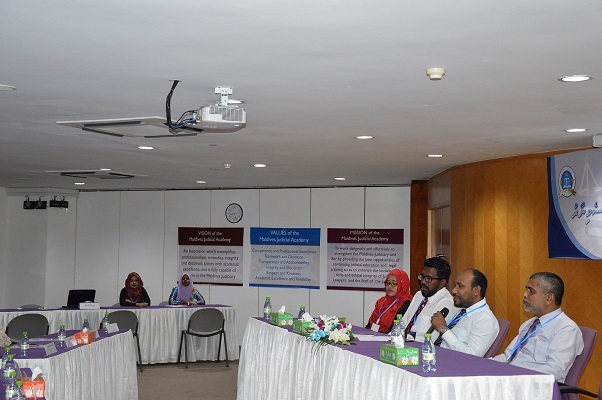 The Maldives Judicial Academy conducted a seminar on the Maldivian Penal Code 2014, in which 27 legal officers from the High Court of the Maldives, the Criminal Court, the Juvenile Court, the Drug Court, the Civil Court, and the Family Court participated. 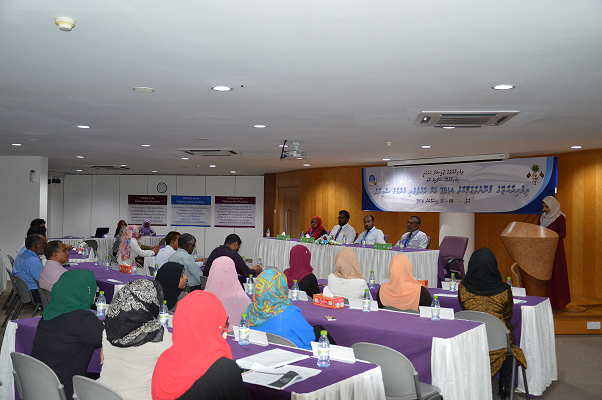 The seminar, titled Seminar on the Maldivian Penal Code 2014, was conducted in Malé, at the Auditorium at STELCO Head Office. The program was conducted from 8th to 11th December. 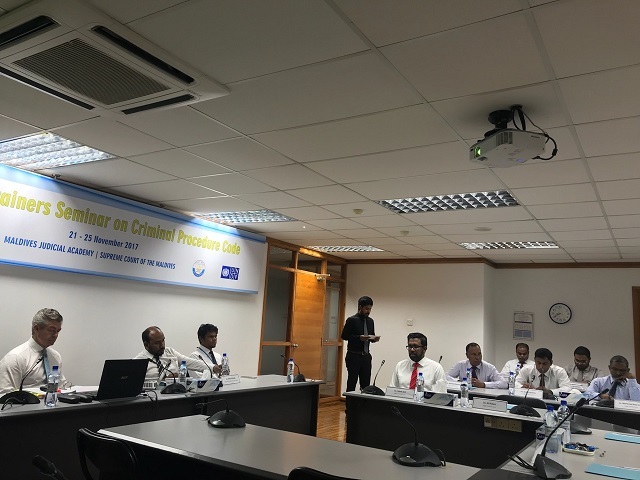 The seminar covered the Maldivian Penal Code from cover to cover, and included one session on crime, punishment, and the criminal justice system, and another additional session as a case study conference. Al-Ustaad Ahmed Maajid, Acting Chancellor of Maldives Judicial Academy, Justice al-Ustaad Abdul Ra’oof Ibrahim from the High Court of the Maldives, and Judge al-Ustaad Adam Arif from the Criminal Court worked as trainers at the seminar. All the 27 participants who registered for the seminar completed it and were awarded certificates of completion by the Maldives Judicial Academy, at the closing ceremony held on the night of 11th December. This was the second edition of a series of seminars that the Maldives Judicial Academy has planned on the Maldivian Penal Code. The first of the series was conducted in Faafu Nilandhoo from 3rd to 7th November this year, in which 34 Magistrates from seven of the twenty Judicial Divisions of the Country took part. At least three editions of the program have been planned for the next year, intended to give training to all Magistrates of the country, according to the Programs and Publications Division at the Maldives Judicial Academy. 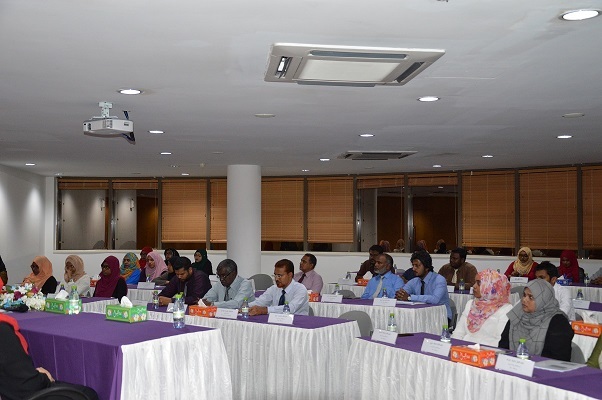 The Maldives Judicial Academy has conducted a seminar on the Maldives Penal Code 2014, for magistrates from Judicial Divisions AA, Vaavu, Meemu, Faafu, Dhaalu, Thaa, and Laamu. 34 Magistrates from the seven Judicial Divisions participated in the seminar, which was used as a platform to discuss the whole penal code, and also conduct a technical session to discuss various issues faced in the implementation and application of the new Penal Code, which replaced an old one in force since 1968. Justice al-Ustaad Abdul Ra’oof Ibrahim of the High Court of the Maldives, and Judge al-Ustaad Adam Arif of the Criminal Court led the discussions and worked as trainers. The program was conducted in Faafu Nilandhoo, the administrative capital of Faafu Atoll. It began on the 3rd of November, and ended on the 6th. Magistrates who took part in the seminar were given a certificate of participation by the Maldives Judicial Academy. Ahmed Mohammed, the Director of the Maldives Judicial Academy worked as the head of organization of the event in Nilandhhoo, together with Court Administrator Ismail Umar from Nilandhoo Magistrate Court, while al-Ustaad Ahmed Maajid, the Acting Chancellor of the Maldives Judicial Academy, was in Nilandhoo for the event as well. The Acting Chancellor spoke at both the Opening and Closing Ceremonies of the event, and highlighted the important role of the Maldives Judicial Academy in strengthening the academic capacity of the Judiciary, and thanked the Chief Justice of the Maldives, Right Honourable al-Ustaad Abdullah Saeed and the Supreme Court for establishing the Maldives Judicial Academy to work to enhance the Judiciary’s capacity.